General Description: Scotch thistle is a branched, biennial or annual with a broadly winged stem that can grow up to 8 feet or more in height and 6 feet in width. Flower Description: Plants flower in mid-summer. The globe-shaped flower heads are borne in groups of 2 or 3 on branch tips. Flower heads are up to 2 inches in diameter, with long, stiff, needle-like bracts at the base. Flowers range from dark pink to lavender. Leaf Description: Leaves are up to 2 feet long and 1 foot wide, are covered with sharp yellow spines and have a gray-green appearance from being covered with a thick mat of cotton-like or woolly hairs. Stem Description: Stems have vertical rows of prominent, spiny, ribbon-like leaf material or wings that extend to the base of the flower heads. Fruit/Seed Description: Seeds are smooth, slender, and plumed. Scotch thistle is a problem in rangeland. 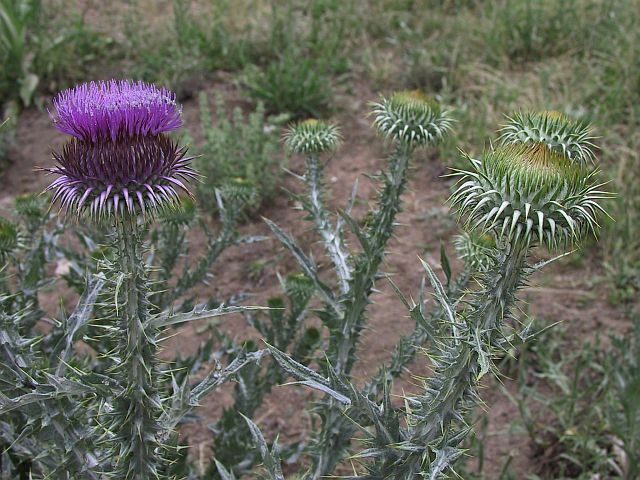 Infestations of Scotch thistle reduce forage production and virtually prohibit land utilization for livestock. Dense stands of the large, spiny plants exclude animals from grazing and access to water.